There are plenty of really nice walking tracks around Binna Burra and I wished there would have been time to do at least a larger percentage of them. 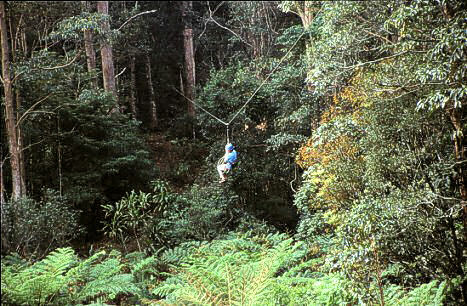 But something I haven't done before is that thing called "Flying Fox". Neatly tied to a kind of seat one rushes through the forrest along a steel rope. Yes, it is nice to know how it feels like. I you haven't done that before, do it. But if I ever get there again, I'd prefer to spend the same time one the walking tracks, as the place is such a fascinating one.